After the short month of February, it’s time for another round of free games for PlayStation Plus and Xbox Live Gold Xbox Live vs. PlayStation Plus: What Do You Get With Each? Xbox Live vs. PlayStation Plus: What Do You Get With Each? If you're got a PS4 or Xbox One, you've probably thought about subscribing to PlayStation Plus or Xbox Live Gold. Let's see what they offer gamers for the price. Read More subscribers. The first Xbox One title is Layers of Fear, a first-person psychological horror game that places you in the shoes of an insane painter. Also on Xbox One, Evolve Ultimate Edition will be free. It’s an asymetical multiplayer game Can't Wait for Evolve? 5 Asymmetrical Multiplayer Games You Can Play Now Can't Wait for Evolve? 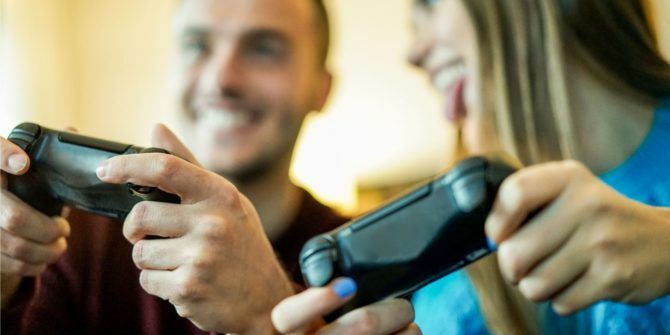 5 Asymmetrical Multiplayer Games You Can Play Now But you don't have to wait until Evolve hits the shelves—you can play these 5 asymmetrical multiplayer games right now. Read More where human soliders are pitted against wild monsters. The Ultimate Edition bundles in everything that was sold separately via Season Passes, so this is a chance to check out an otherwise disappointing game. On the Xbox 360 side, you can pick up Borderlands 2, the excellent action RPG shooter full of side missions and loot — it’s great with friends! The other free 360 title is Heavy Weapon, a deluxe version of the browser-based shoot ’em up tank game. Remember that Xbox One owners can also play the Xbox 360 titles through the Xbox’s backwards compatibility. Since Sony releases the games on the first Tuesday of the month, PS gamers will have to wait until March 7th to enjoy these titles. First up on PS4 is Disc Jam, a new sports title that crosses air hockey and tennis. It looks to re-create the explosive launch that Rocket League had on PlayStation a few years back. The other PS4 title is Tearaway Unfolded, an expanded version of the Vita game. It’s an adventure where everything is made of paper from the creators of LittleBigPlanet. PS3 owners will get Under Night: In-Birth, a modern fantasy 2D fighting/visual novel game. PS3 owners also receive Earth Defense Force 2025, a third-person shooter full of action where you’ll take the fight to alien invaders. Finally, the Vita receives Lumo, an isometric platformer that calls back to the classic genre. One of the best titles this month is Severed on Vita. A first-person action-adventure game, Severed makes excellent use of the Vita’s touch screen for combat and is one of the best titles on the system Considering a New Slim PS Vita? These Cool Games Will Convince You Considering a New Slim PS Vita? These Cool Games Will Convince You Are you ready to get a Vita? Read on to discover its must-have games at every price - even free! Read More . Are you looking forward to any of this month’s titles? Let us know what you plan on playing down in the comments!